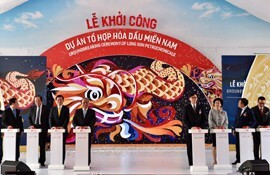 PM Nguyen Xuan Phuc on February 24 attended the groundbreaking ceremony of US$4.5 billion Long Son petrochemical complex in Vung Tau City of the southern province of Ba Ria-Vung Tau. The Long Son petrochemical complex, jointly invested by the Thailand's SCG Group and Viet Nam Oil and Gas Group (PVN), is located on the area of 464 ha on land and 194 ha on waters with the total investment of US$3.77 billion and could be increased to US$5.4 billion. Once completed, it will be one of the largest of its kind in Viet Nam, with a production capacity of 1.6 million tons of olefins per year. It is also designed to produce all kinds of petrochemical products, including necessary materials for plastics with the capacity of more than 2 million tons per year. The project is expected to come into operation by 2022, creating around 20,000 jobs during the construction process. Speaking at the ceremony, the PM urged the investors to ensure the project progress and apply advanced technologies for the project while strictly following Viet Nam’s regulations on environmental and social protection as well as labor safety. He also asked ministries, agencies, the PVN and Ba Ria-Vung Tau authorities to facilitate the implementation of the project-a symbol of the Viet Nam-Thailand Strategic Partnership. SCG Group President and CEO Roongrote Rangsiyopash expressed his belief the project will help further stimulate the ongoing remarkable economic growth of Viet Nam. He also expected the project will help encourage long-term investment in related industries in order to improve the competitiveness of the products and reduce import of petrochemical products. Investor representatives committed to strictly obeying international regulations on safety, environmental friendliness and sustainable development throughout construction and operation.